This edition of my dividend income is going to be a little philosophical as I encounter many conversations around fear of losses, the upcoming market correction, and the interest rate impact on income stocks. All of which is part of a cycle and how investors are emotionally tested along with their portfolio. In short, you are being tested and investors are their worst enemy. With that said, here are the trades I have executed. I tend to trade small amounts and I will average in my desired position. I purchased CIBC TSE:CM in my taxable account. I had been accumulating VFV through Questrade for no fees and realized that the accounting was going to be a pain due to the distribution and return of capital so I bought one of Canada’s premiere holding; a bank. Boring actually works. I also wanted to round up my financial sector with an asset management stock and purchased BlackRock NYSE:BLK and reduced my real estate exposure for now. For the financial sector, I now have Canadian banks, a credit card stock and an asset management stock. Considering the many questions I get are in regards to a stock market crash, it’s very important for investors to understand the difference between a paper loss and a real loss. Every day, your portfolio wins and loses value. Regardless of the purchase price, you may lose profit or gain some. Why is the loss of profit on a day-to-day not worrying you as much as the loss against a purchase price? A stock market crash is simply an amplified version of the day-to-day fluctuation. Those that need to plan for a stock market correction, are investors who have stopped adding money to their portfolio and need to withdraw. The reality is that if you are in this situation, your portfolio should be set up in a way that any stock market fluctuation is not impacting your income in the short term (as in 1 to 3 years). In my view, you are either in the accumulation phase and can benefit from a market correction or you are in the income phase and prepared yourself against any corrections. If you don’t feel ready for a stock market correction, you need to review your affairs and your approach to investing. I know, simpler said than done. Statistically speaking, time, as many have written, is very important. The more you give your investment time, the more chance for success you have. The first year requires patience while the stock fluctuates. A solid company with a solid business will bounce back. 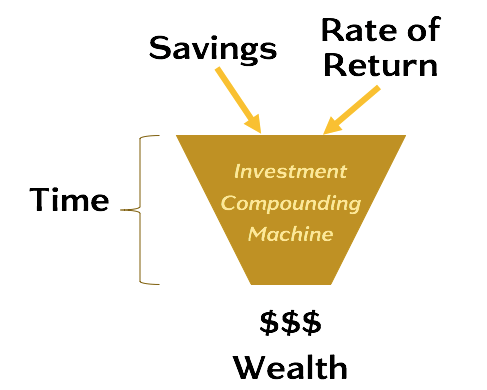 If you invest for income, time is no more a factor and chances are that your savings rate doesn’t apply either. The dividend, or distribution, safety is what matters and there are still risks if you are 100% into equity. Companies are sometimes bought, or yield can be impacted to grow the business or pay for an acquisition. It’s the CEO’s role to deploy the money for the benefit of shareowners and it’s not always in the form of distribution. 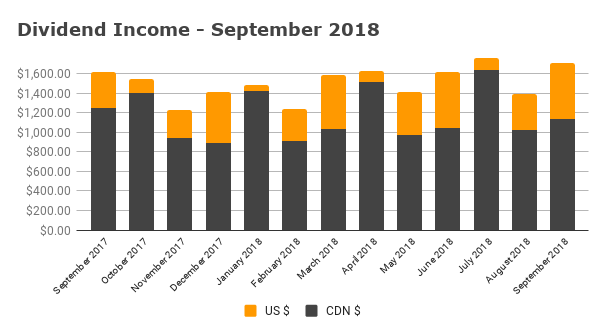 My September 2018 dividend income is $1,704.42. I treat all USD dividend income as a $1 CAD. I do not apply any conversion rate in my reports. It’s like a safety margin and it would cover any USD spending we may do in retirement.